Let’s put it out there right off the bat. I’m a realist and very pragmatic. I love stories about people, even if they are fictional, stories that delve deeply into human struggles in order to bring out the best of humanity—the values, the heroism, and the beauty. So, with that said, I sometimes struggle with fantasy stories that force me to think in symbols rather than in actual concepts and concrete images. That’s the gift of fantasy. These stories take us into another world of imagination allowing art to speak to those innate questions of our life and existence as only art can do. The Best Picture Oscar winner The Shape of Water challenged me in this way. 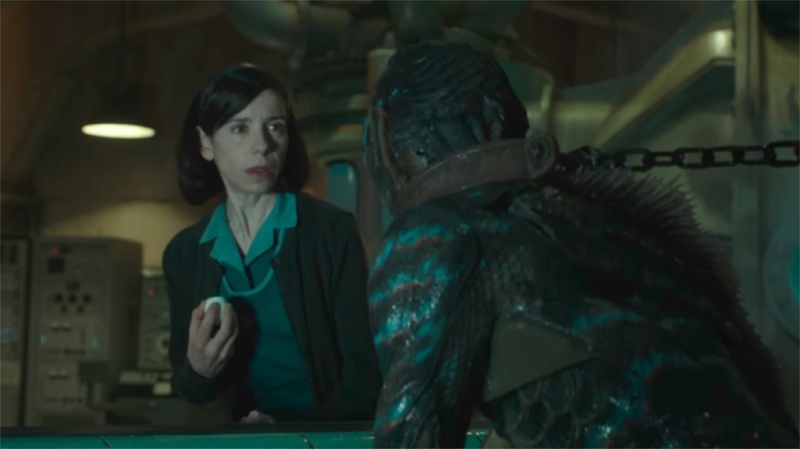 It’s not my favorite movie of the year, by far, but as I reflect on it and what led Guillermo del Toro to create such a bizarre but telling story prompted me to consider its underlying meaning and symbolism. A Mexican and Roman Catholic in background, del Toro, though lapsed in the practice of his faith, still holds much Catholic symbolism in his consciousness that is worth exploring. The film’s story focuses on Elisa Esposito (Sally Hawkins), a mute woman who works as a cleaning lady in a government research facility. The film takes place in 1962, the best and the worst of times. The best as far as the idealized fantasy of America’s Camelot in the White House and American world influence, but the worst because of it’s lead-up to the Kennedy assassination a year later. Elisa symbolizes the marginalized and powerless in this idealized world. She represents those who have no voice, those who are exploited by an authoritarian system, symbolized in Colonel Strickland (Michael Shannon), who follows the rules to look good in front of his superiors. His life is lived by the letter of the law. Elisa, however, lives through her openness to life and others. She is surrounded by other marginalized peoples: African-Americans, manual laborers, foreigners, and homosexuals. This fable echoes classic monster movies but also love stories, though be it with a sea creature. To say the fish-like creature is a Christ figure is a far stretch of the imagination. However, there is some Christian symbolism present in the story. The symbol of a fish has a long history of meaning in Christianity. Since the early Christians were being persecuted, the Greek Ichthys, or fish symbol, became a sign of where the Eucharist was celebrated, referencing Jesus’ multiplication of the loaves and fishes and the idea of communion among believers. By making the water creature the character in the story that connects with society’s outcasts and those who have no voice, does resonate with Christ who spent time with the tax collectors and prostitutes. Christ came to earth to defy the powerful and bring redemption to all. So, even though the creature dies and then rises again to save Elisa, Christ saves all of humanity in a total and complete sacrifice of love that surpasses human imagination. In Christ’s eyes we are all complete, being made in the image and likeness of God. It is interesting that the movie showing at the theater that Elisa passes is the biblical epic, The Story of Ruth. Ruth is a foreigner among the Israelites and connects with a people whose God is a loving and mighty God. When her husband dies, her mother-in-law, Naomi, expects her to go back to her Moabite people. But Ruth remains with Naomi saying, “I will follow you wherever you go, and where you stay I will stay. Your people will be my people and your God will be my God” (Ruth 1:16). Elisa perhaps really came from the water since she was found by the river as a baby and has a mark on her neck as if gills were present. By connecting with the water creature she is really returning to where she belongs. We all yearn for connection and communion, to belong somewhere and to someone. This is what it means to be human, which this fantasy story ultimately expresses. It may not be a film for everyone, since I have my misgivings about its depth, yet it does challenge me to see more deeply into the need for connection in our lives. We cannot live alone. We must be in communion with others and that takes work. That requires a suspension of judgment to see to the Christ figure present in each human being, showing forth a beauty and gift for the whole world to see.